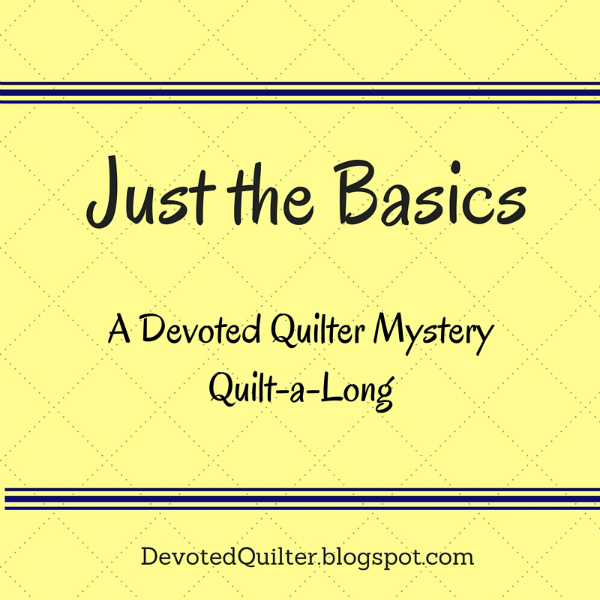 Welcome back for month 3 of the Just the Basics Mystery Quilt! It's never too late to join in. All of the posts can be found under the tab at the top of the blog, so you can start anytime. New posts will be published here on the first Wednesday of each month. You can follow Devoted Quilter by Bloglovin, email or Feedly to be sure you don't miss anything - the links are all on the sidebar. You can also sign up for my new newsletter, The Bulletin, the first issue goes out on the 16th of this month! In case you're just getting started, March was fabric selection and April was HSTs. Now let's get going! As you might have guessed from the title of this post, this month we'll be making two different units, flying geese and square-in-a-square. Again, we'll make both a little larger than needed and then trim them down so they'll be perfect. 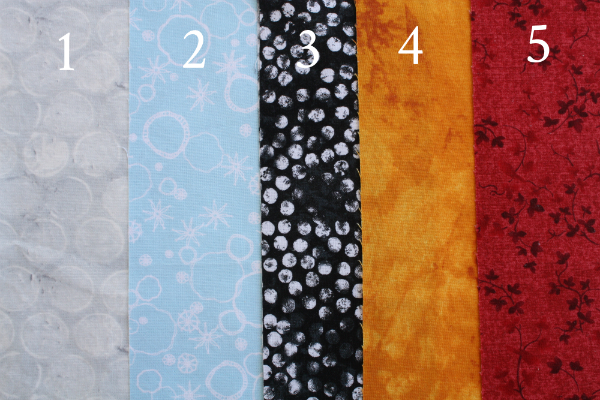 Once again, as a reminder, here are the fabrics I've chosen for my quilt. 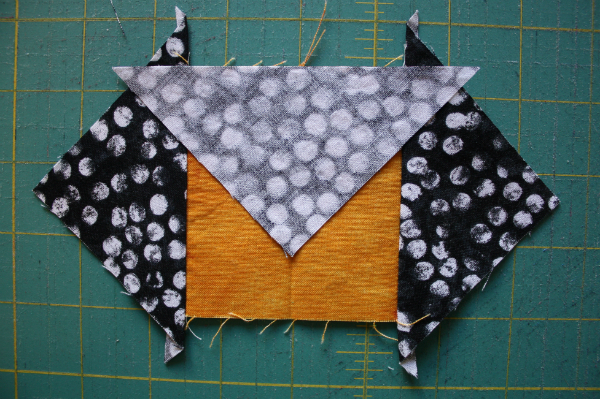 Like HSTs, flying geese appear in many quilts and quilt blocks. You can check out my Pinterest Flying Geese board to see some examples. We'll be using fabric 1 for the 'geese' and fabric 2 for the 'sky'. With my fabrics, that means the geese will be grey and the sky will be blue. 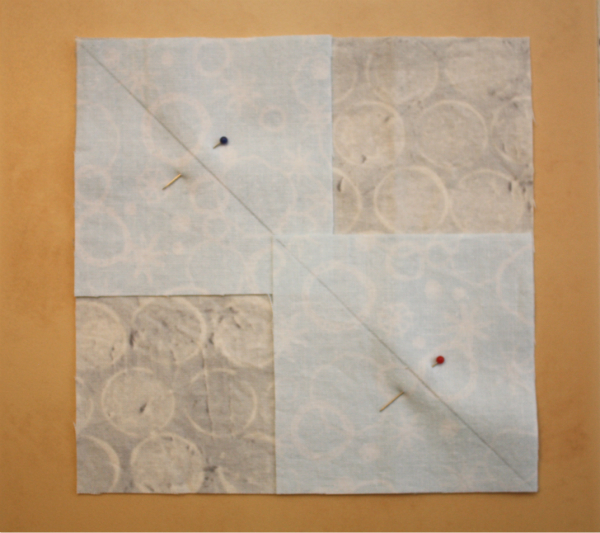 We'll be making these using the four at a time, no-waste method and chain piecing too. Don't you love how chain piecing can speed up the process? From fabric 1 - 16 squares 5 3/4" x 5 3/4"
From fabric 2 - 64 squares 3 1/4" x 3 1/4"
From fabric 1 - 30 squares 5 3/4" x 5 3/4"
From fabric 2 - 120 squares 3 1/4" x 3 1/4"
On the backs of all of your fabric 2 squares, draw a diagonal line from corner to corner. 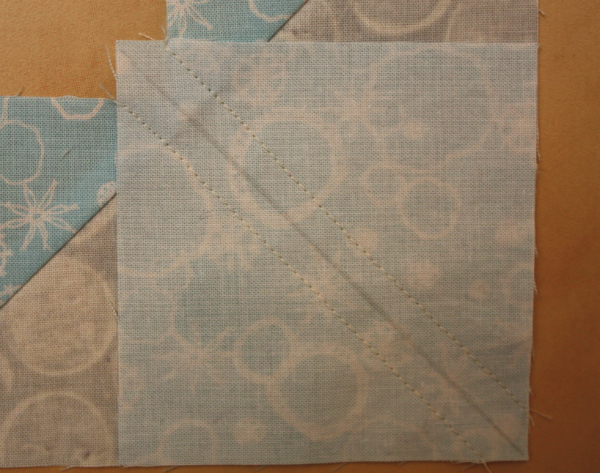 Right sides together, position 2 fabric 2 squares in opposite corners of a fabric 1 square as shown. 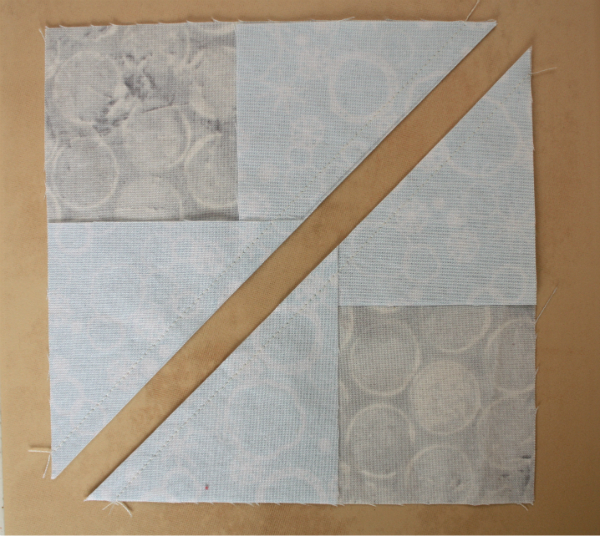 The fabric 2 squares will overlap in the middle and the drawn lines should form one continuous line. Pin. 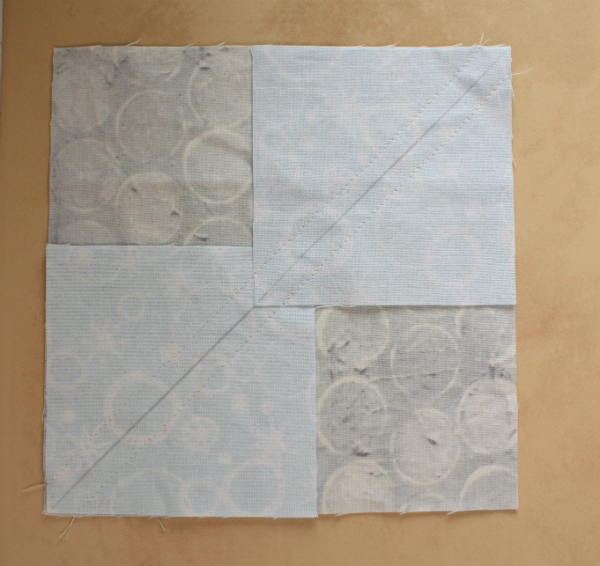 Do this with all of your fabric 1 squares so that the whole pile is ready for chain piecing. Press the fabric 2 triangles open. Right sides together, position another fabric 2 square in the corner of the fabric 1 triangle as shown. Be careful that the drawn line is positioned as shown. Pin. Again, do this for all your units at once. Stitch 1/4" from the line on both sides. 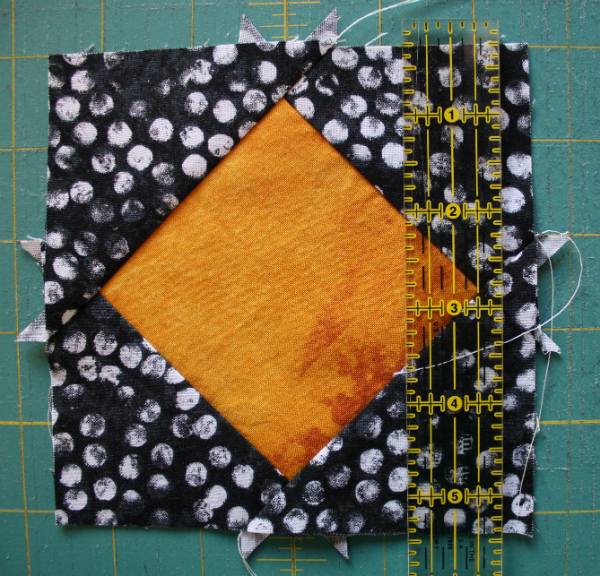 Cut apart on the drawn line and press the fabric 2 triangle open. You now have what is likely a somewhat imperfect flying geese block, as these blocks are also notorious for being hard to piece perfectly. A little trimming will fix that right up and you'll have a perfect 4 1/2" x 2 1/2" block. You will notice in these pictures that I used two different rulers. That's because one of my rulers is really long and somewhat unwieldy and my smaller one doesn't have a 45° line on it. You can certainly do all of this trimming with one ruler. 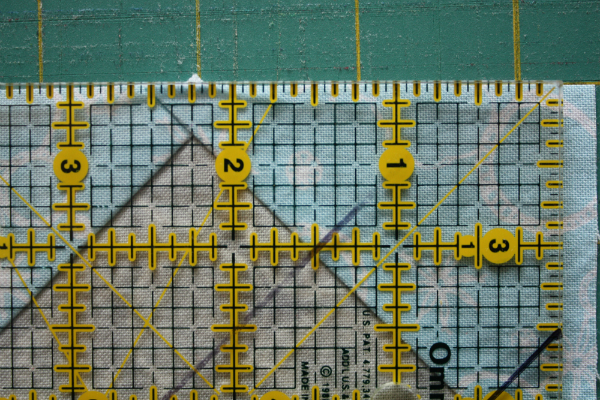 With the flying geese block on your cutting mat, position your ruler so that the 45° line is exactly on top of the diagonal seam in your block and the 1/4" mark is exactly touching the tip of the triangle. Trim across the top of the unit. 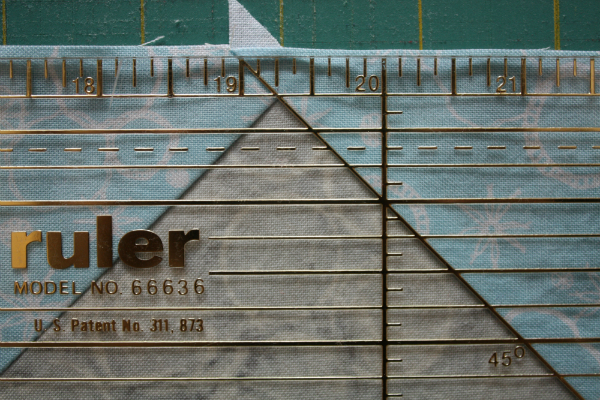 Now align the top of your ruler with the top of your block. Position the 2 1/4" mark at the point of the triangle and trim the right hand side of the block. It seems I forgot to take a picture of the next step (sorry!). Turn the block so that the top of the block is now at the bottom and align the bottom of the ruler with the bottom of the block. Position the 2 1/4" mark at the point of the triangle and trim the side. All that's left now is to trim the excess off the bottom of the blocks, and that can be done in batches. Align a couple of blocks so that their tops are even. Trim the blocks to 2 1/2" wide. And there you have it - perfect flying geese! 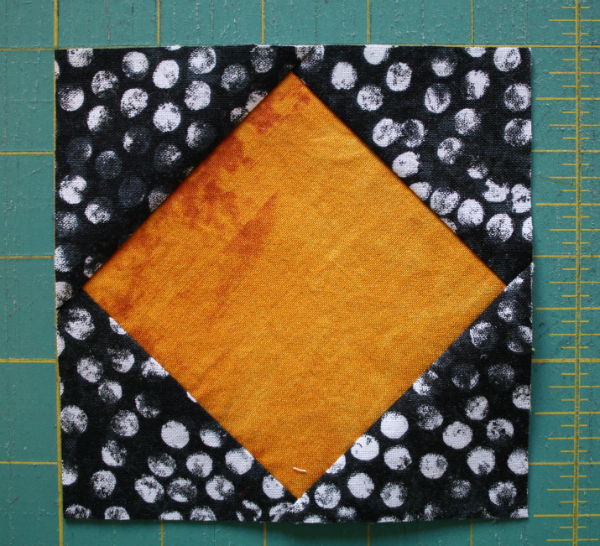 Square-in-a-square blocks, and their siblings the economy blocks, are not quite as famous as HSTs and flying geese, but they still pop up in plenty of quilt designs. Unfortunately, they are also hard to piece perfectly (are you sensing a theme here? 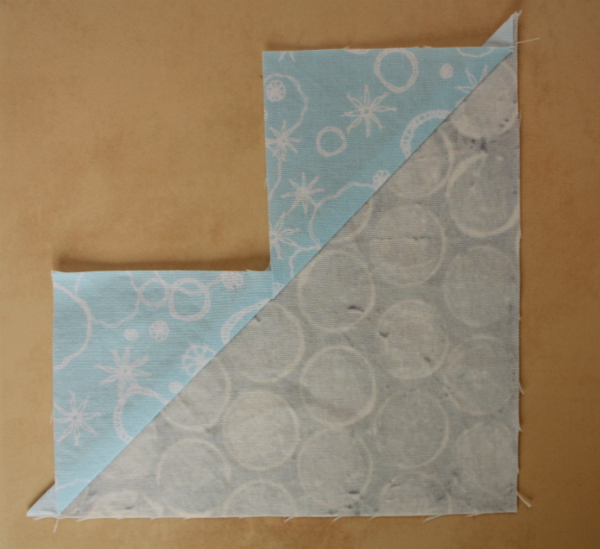 ), but making them a little larger than needed and then trimming eliminates all the hassle of trying to sew together imperfect blocks. 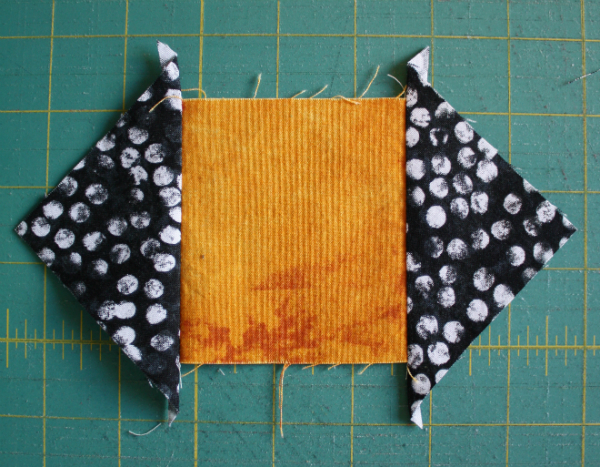 We'll be using fabrics 3 and 4 for our square-in-a-square blocks, and in my fabrics that means the orange and black fabrics. 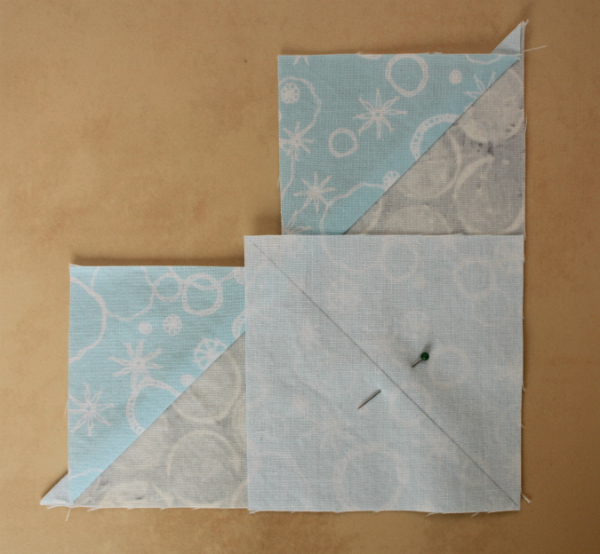 For the baby/wall size, you need 16 square-in-a-square blocks. For the throw size, you need 30 square-in-a-square blocks. From fabric 4 - 16 squares 3 3/8" x 3 3/8"
From fabric 3 - 60 squares 3 1/2" x 3 1/2", cut once diagonally to yield 120 triangles. From fabric 4 - 30 squares 3 3/8" x 3 3/8"
Fold a fabric 4 square in half and crease lightly. Fold one fabric 3 triangle in half along the long side and crease lightly. Place the triangle right sides together with the square, matching the creases at the top edge and matching the point of the triangle with the crease on the square. The ensures that the triangle is perfectly centered and straight. As you can see in the picture, the points of the triangle will extend past the edges of the square. Do this with all of your fabric 4 squares, then chain piece all of them at once. 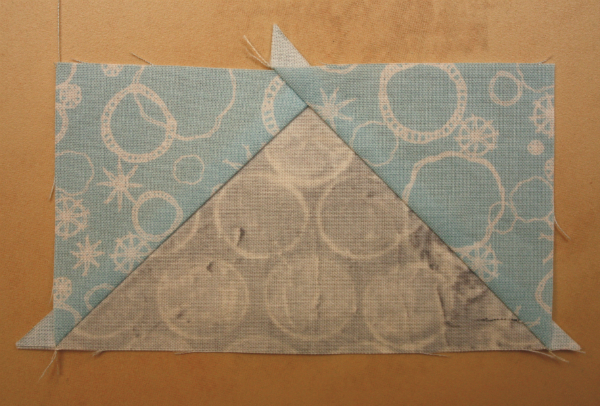 Press the triangle open and repeat with another fabric 3 triangle on the opposite side of the square. Press the second triangle open. 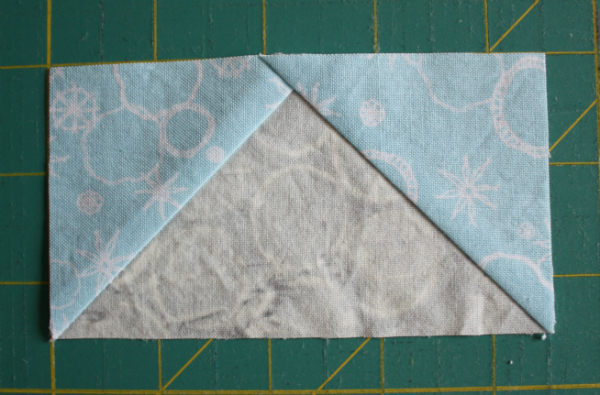 Fold the square in half in the opposite direction and crease lightly. 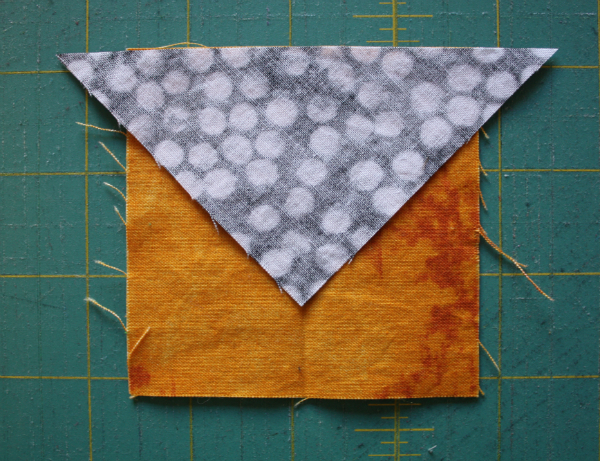 In the same manner as before, add triangles to the two remaining sides of all of your fabric 4 squares. Now you have (once again) slightly imperfect blocks ready for trimming. We will be trimming these to 4 1/2" squares. 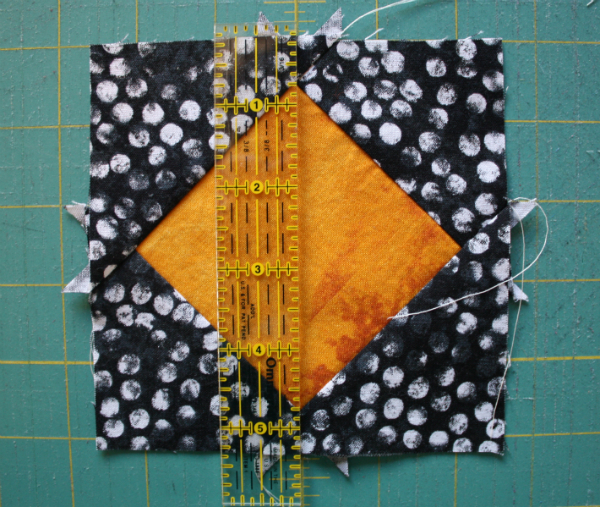 Line up your block on your cutting mat so that the top and bottom points of the center square are exactly on a line. I used my small ruler to check that the points were lined up. Now measure 2 1/4" from the center points and trim the side. As you can see, 2 1/4" from the center points leaves me exactly 1/4" from the side point. Trim all four sides the same way. If you have a rotating mat (or one that's small enough that you can turn it and still reach your block easily), then you can line up the center points, trim the first side and then turn the whole mat to trim the second side. Then turn the block, line up the center points and trim the remaining two sides. Otherwise, just turn your block and line up the center points before trimming each side. 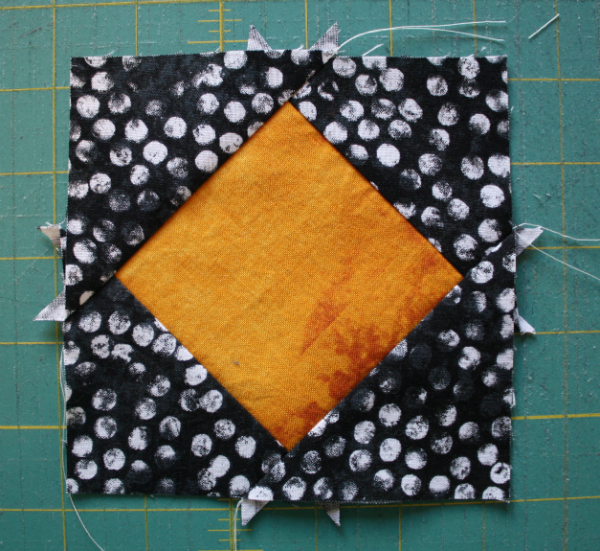 And now you have perfect 4 1/2" square-in-a-square blocks! That's it for this month! I can't wait to see your progress! Don't forget to tag me (@devotedquilter) and use #JustTheBasicsMysteryQuilt if you're on Instagram. You can also leave me a link to a blog post in the comments or email me a picture (devotedquilter at gmail dot com). I'll be back with the next step in June! I'm glad I pressed all my HST's the other day. Now I'm ready for this step. 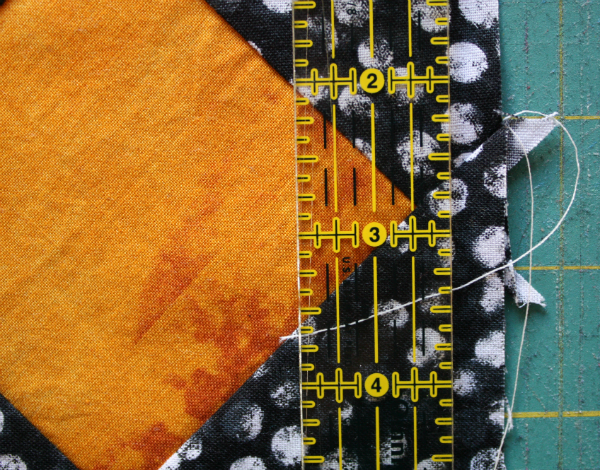 You told us to cut fabric 4 squares into triangles, but fabric 4 is orange and it's the center square. Am I reading this right? I'm done early this month!